The city of Scottsdale is full of fun for the whole family. No matter what hobbies or interests you and your loved ones enjoy, there’s something for everyone. And this is a great time of year to get outside and enjoy the cooler weather! However, just because it’s cooler out doesn’t mean the sun is any less harsh—you still have to be careful. 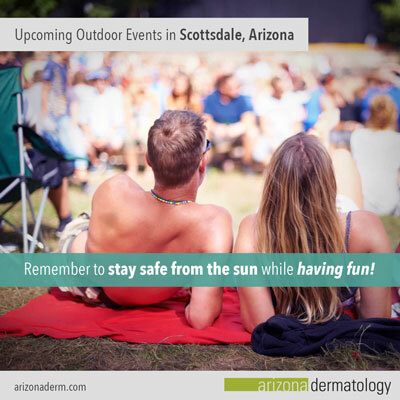 In this article we’ll cover how to protect yourself while you’re out and about at one of the many exciting events happening this fall in Scottsdale! To prevent sporting a sunburn or taking a trip to the ER as a “souvenir,” don’t forget to take some precautions. Though a few of the upcoming outdoor events are during the evening, many are during the time of day when the sun’s rays are most intense (between 10 AM and 4 PM). Throwing caution to the wind when it comes to sun protection is easy to do when you’re having a good time, but could result in a painful sunburn, peeling skin, dehydration, or even heat stroke! Apply sunscreen with SPF 30 or higher 30 minutes before you’ll be outdoors. Read our article on The Best Sunscreen for tips on correct application as well as some products we recommend. Park as close to the event as possible and look for the shadiest spot you can find. You can also purchase a sunshade for your windshield to reduce the risks of touching an extremely hot steering wheel and seatbelt. Stay hydrated by loading up a cooler with plenty of water and drink up before, and after, the event. Wear sun protective clothing and tennis shoes. Sandals can get hot and aren’t comfortable for hours of walking. You may want to bring water shoes if you go to a pool. Imagine traversing paths surrounded with beautiful saguaro cacti, Palo Verde trees, and colorful wildflowers on a mild October day—on your bike! This dream is a reality for over 12,000 cyclists and spectators who’ve attended the annual Tour de Scottsdale anytime in the past 11 years. If you decide to attend this event, you’ll not only get to enjoy the beautiful Sonoran Desert scenery (whether you brave the 30 or 70-mile course or just cheer on the sidelines), but you’ll also be helping to raise awareness for the McDowell Sonoran Conservancy, the event’s beneficiary. After crossing the finish line, great food and fun are waiting at the numerous restaurants that line the street. Don’t forget to lather on sunscreen before you head to the starting line. There won’t be any shade if you’re going for the ride, but you can take cover and cool down at one of the restaurants afterward. Say “hola!” to gourmet tacos for only $2 each, Lucha Libre wrestling, cooking classes, eating contests, and of course, all the tequila you care to drink! This year’s event is happening October 17th and 18th from 11 AM to 7 PM at the Salt River Fields. Kids under age 12 get in free, and parking is also free. The $12 admission also includes live music (Mariachi band, anyone?) and an incredibly cute and entertaining Chihuahua beauty pageant. Bring sunscreen and re-apply if you sweat or get wet (you never know what will happen at this festival). You may even want to sport a sombrero to not only look festive, but enjoy extra protection from the sun’s rays. Olé! If you have young kids who love the zoo (what kid doesn’t?) then Howl-o-Ween could become your next family tradition! Happening on two nights, October 23rd and 24th, this event includes a variety of different activities to choose from. For younger children there are “Merry” activities which are more “fun” than “fright,” and for thrill-seekers over age 8 there are “Scary” activities that will do the trick. Just remember that because this event is during the evening (6:30 to 10 PM), your family won’t be able to see many animals since they’ll be asleep. But the good news is you won’t have to worry about protecting yourself from the sun since it will be “asleep” too! To see the animals you’ll have to bring the kids back during the day. If you do go back during the day, lather on the sunscreen and cover up with hats, sunglasses, and maybe even umbrellas. Fall in love with art at the 3rd Annual “Fall for the Arts” ArtWalk. The Arts District of Scottsdale will be painted with exhibits from a variety of artists. You’ll see everything from glasswork, to abstract paintings, to ceramics and wood. With so many different galleries and artists showing off their wares, you never know what unique works of art you’ll find here. Enjoy live music, artist demonstrations, and gallery receptions from 7 to 9 PM on November 12th. And given that it’s after sunset, you’ll get to enjoy the cooler temperatures and starry skies without having to worry about your skin! Attention vintage car lovers: this one’s for you. The inaugural Grand Prix of Scottsdale is racing to town on November 7th and will celebrate the racecars of the roaring 20s and the “guys and dolls” who aspired to drive them. If you’re ready to go for a spin you can even sign up your racing team today! Even if you don’t love vintage cars, if you like the book The Great Gatsby or are just fascinated with the flappers and flyboys of this era, you’ll enjoy the ambience here. Get up close and personal to see the race from the sidelines or head to the beer and wine garden to relax in the shade. If you love golf, the Charles Schwab Cup Championship is sure to be on “par” with your tastes. Take your sunscreen and be sure to wear your sun protective clothing since you’ll be out in the sun’s rays all day. You may also want to bring your camping chairs or a picnic blanket, so you can comfortably enjoy watching the top players in the PGA compete for the title. Baseball fans can continue to enjoy the game after the World Series is over with the Arizona Fall League! The Salt River Rafters will be playing at the Salt River Fields at Talking Stick. Depending on the time of day, some seats are in the shade while others aren’t, so wear your baseball cap and sunglasses to make sure you’re protected either way. By now, wearing sunscreen should go without saying! If you love art and want to enjoy even more of it (with free admission), then the ArtFest of Scottsdale is the place for you! Happening November 21-22 at the beautiful Civic Center Plaza of Scottsdale, you’ll get to see art from over 150 different artists. This is one event where you get to take your pets with you, too! The hours are from 10 AM to 5 PM and you’ll do a lot of walking around in direct sunlight, so make sure to wear sunscreen, a hat or umbrella, sunglasses, and comfortable shoes. Take breaks in one of the many tree-covered shady areas. A parking garage is available so that you can park your car in the shade.